We’re two friends walking along the cliffs overlooking the Pacific. For one of us the walk is preparation for a 200-mile pilgrimage, for the other, it is a chance to taste a part of the adventure vicariously. Patty is training. I am tasting. Later this month, she’ll fly to Spain and walk two-fifths of the 500-mile journey from France to Santiago de Compostela, a path trekked by thousands of pilgrims over nearly two thousand years. I’m going to be right here waiting for her to come back and tell me all about it. Patty isn’t religious. She just wants to walk that road, sleep with strangers in hostels, sip coffee in the company of pilgrims and taste the food she will find along the way. Although she has logged thousands of miles on planes, trains and automobiles, walking or biking is her favorite way to travel. She will leave laptop and cell phone behind as she always does. She will leave her husband behind this time too, although he has put almost as many miles on his feet and bike as she has. The trip will find its way unfiltered into her soul and her memory. Now that I don’t have to walk and in fact spend most of my time sitting in front of a computer screen, I am fascinated by the idea of covering great distances by foot. I follow blogs or news reports of cross-country walkers. I order catalogs for walking tours in Europe, Africa, and Asia. I like to imagine myself seeing a place up close for the first time, feeling it in the fatigue of my muscles and the contours of the road beneath my feet. In my mind I’ve walked thousands of miles which is a little like saying that I’ve written ten novels without typing a single sentence. Patty, on the other hand, is the real deal. 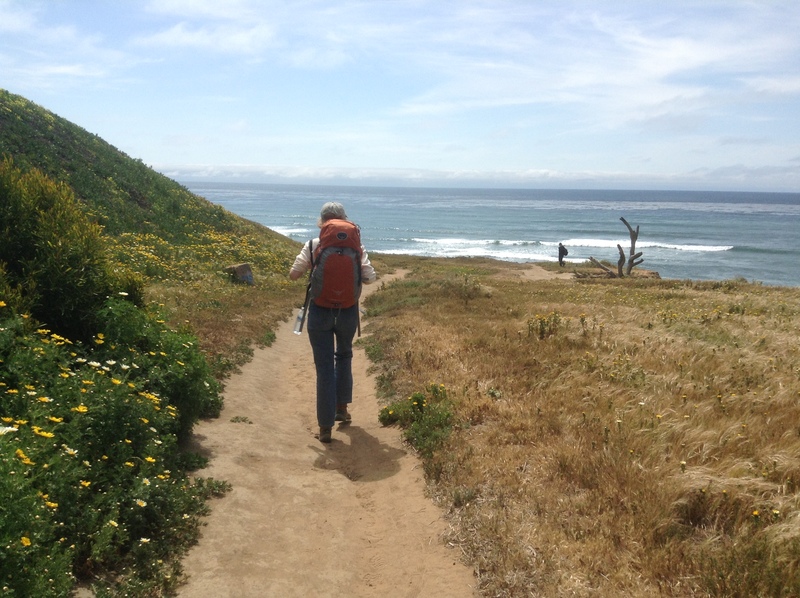 She’s packed her fourteen-pound backpack and is training by taking long walks around San Diego. Not that she needs much training. This is a woman who makes a business out of walking the neighborhoods of the city and bringing them alive to tourists and natives alike. She bikes around town as often as she drives. She has logged thousands of miles visiting nearly 80 countries and has tried to spend at least some time walking or biking in each. Not long ago, she walked across the English countryside with her husband, Rusty and in the eighties, they spent two and a half years circling the globe by air, boat, train, car but as much as possible by foot and bike. For Patty, traveling is defined simply as, “going someplace new.” She adds, “I don’t care if it is pretty or not or if the food is good. I want to know what it is like to live in a place.” This doesn’t mean that no one has been there before her. It simply means she has not been there and when she does go, she wants to take it all in, warts and all. She understands that seeing a place, really seeing it, makes it new. As we make our way along the edge of the ocean, I find myself thinking how differently we travel but also about the similarities in our work and lives. We are both pilgrims in a way. We both come from small towns miles from anywhere “exciting.” Patty is driven to explore a place she has never seen. I am driven to explore the terrain of the heart and mind. She is always searching for something new to see even in places she knows by heart. I am searching for a new way to express ideas so old they have no age. She likes waking up in the morning, setting out in the direction she has picked and finding what she needs along the way. I get up in the morning with a plan, a direction and then, along the way must forage for material, for ideas, for words. Sometimes they come just exactly the way I thought they would. Most times, though, they surprise me and alter my course. And this Patty understands too. The surprise is the thing that pilgrims are most in search of whether they realize it or not: that serendipitous moment, a flash of insight, a family that lets you pitch a tent on their farm and then invites you in for dinner, a glimpse of a rare bird or a view that no photograph can ever capture. There is art to it, discipline and joy. I am thinking that this is why writers like Dickens, Twain used to walk ten miles or more a day and why, more recently writers like Cheryl Strayed have chosen to make one spectacular journey with nothing between them and their goal. Their physical journeys feed their journeys as writers. I wanted to tag along with Patty on her training walk to see if I could get a little of her journey to rub off on me – to make it mine. But that’s not how it works in walking or writing. To really see something new, even in a place you have lived for years, you have to do it yourself. Another bonus link I found for Bradbury fans. It is in German but even if you do not speak that language, the story comes through loud and clear and the images are perfect. The Pedestrian – German live action short. You need to do this! Loved this one. Wow! I live in San Diego and just came back from Madrid! How awesome! 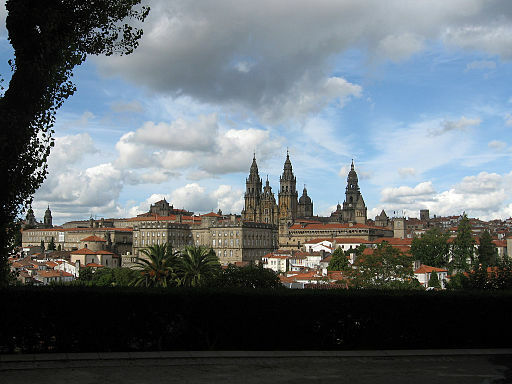 I have long dreamed of doing the Santiago de Compostela pilgrimage. I hope you will tell us all about it when Patty gets back. Thank you so much for stopping by. I’ll be sure to let you know what Patty tells me — believe me, I’ll be wanting all the details.